A Papuan activist with his forehead painted with banned separatist flag the "Morning Star" marches with others during a rally commemorating the 57th anniversary of the failed efforts by Papuan tribal chiefs to declare independence from Dutch colonial rule, in Surabaya, East Java, Indonesia, Saturday, Dec. 1, 2018. The recent killings highlight how Indonesia’s attempts to use economic inducements to secure peace in Papua are failing. In early December 2018, separatist militants killed about 20 people in the Nduga Regency of Indonesia’s easternmost Papua Province. Those killed included at least 19 construction workers employed by a state-owned firm, PT Istaka Karya, which was engaged in various infrastructure development projects in the region, and one Indonesian soldier. According to an eyewitness, who is reportedly a survivor of the massacre, the militants abducted 25 workers from their camp. The workers were marched for a short distance, and then shot. Four of the workers managed to escape by pretending to be dead. The others remain unaccounted for. In the days following the massacre, the Tentara Pembebasan Nasional Papua Barat (West Papua National Liberation Army, TPNPB), claimed responsibility for the incident. The TPNPB is an armed wing of the Organisasi Papua Merdeka (Free Papua Movement, OPM), an umbrella term referring to the disparate groups which comprise Papua’s pro-independence movement. The TPNPB alleged that the victims were Indonesian military personnel dressed in plainclothes rather than civilian construction workers, and demanded that the government pave the way for an independence referendum. Support for independence from Indonesia is reportedly widespread among Papuans. For example, in a September 2017 independence referendum petition, which was rebuffed by the United Nations, around 70 percent of Papuans polled said they favored independence. Papuan separatist groups have waged a low-intensity insurgency since at least 1969, when the region, which had previously been a Dutch colony, was formally incorporated into Indonesia. This was controversially accomplished through the Act of Free Choice, sarcastically dubbed the Act of No Choice by Papuan independence activists, in which the Indonesian military forced 1,026 tribal leaders to vote in favor of incorporation on behalf of the entire Papuan population. Given this history, many Papuans see Indonesia as a foreign occupier. They also accuse the Indonesian authorities of committing widespread human rights abuses against the local population. According to activist groups at least 500,000 Papuans have been killed by security forces. 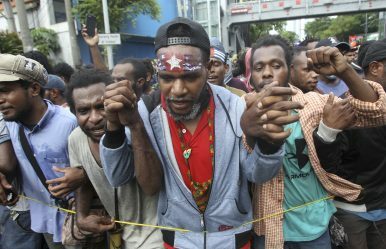 Prior to the massacre in Nduga, Indonesian authorities arrested some 537 Papuan protesters participating in countrywide December 1 rallies marking the 1961 West Papua congress, in which the pro-independence “morning star” flag was first raised. Since coming to power in 2014, Indonesian President Joko “Jokowi” Widodo has arguably paid greater attention to improving relations between the Papuan community and central authorities than any of the country’s previous leaders. His approach has primarily focused on economic inducements, including increasing funding for poverty alleviation to the extent that Papua receives a greater proportion of Indonesia’s development budget than any of the country’s other regions. It has also included increased spending on infrastructure development projects. One of the most notable of these is the Trans Papua Highway, an ongoing road construction drive spanning some 4,325 kilometers across West Papua and Papua provinces. The 19 construction workers allegedly killed were building a bridge connected to the highway in Nduga. Economic inducements are, however, unlikely to improve the security situation in Papua. Local opposition to Indonesian rule is fundamentally driven by the aforementioned historical and political factors. While undoubtedly welcome in Indonesia’s poorest province, economic development will not make these long-standing grievances disappear. In fact, infrastructure development drives have been met with suspicion by separatist activists and militants alike. The Trans Papua Highway, in particular, is seen by the OPM as an attempt to expand Indonesia’s reach into remote regions in Papua’s interior, which had previously been inaccessible due to the mountainous jungle terrain. In the wake of the massacre, the Indonesian military announced it would take control of construction projects due to security concerns in the region. However, this seemingly validates the separatist opposition to these projects. It will be easier to characterize infrastructure development as part of a plot to expand Indonesian influence into remote areas if the security forces, which are already negatively perceived in Papua, are directly involved. As a result, despite Jokowi’s economic inducements, instability will likely remain prevalent throughout the region. Rob Attwell is an Asia-Pacific Analyst at S-RM, a global Corporate Intelligence, Crisis Management and Cyber-security consultancy.